Contour Backpack is the ultimate in mobility for comfort-minded professionals. Unique, fully-adjustable lumbar support that uses a contoured panel to hug the back and help shift weight onto the hips. The curved, shock-absorbing shoulder straps help keep the load light while the padded SnugFit sleeve delivers heavy-duty computer protection.PRODUCT FEATURES: Contour adjustable lumbar support panel reduces fatigue by shifting weight onto the hips; Endorsed by American Chiropractic Association; Padded, contoured shoulder straps ease neck and shoulder strain; SnugFit compartment suspends and wraps laptop for drop protection; Flap-free access to quickly reach computer and contents; Convenient front pocket organizes key items at your fingertips; Handle doubles as strap to hang case from wheeled bag; Expandable bottle Holster and headphone port for MP3 player; 1680 Denier Ballistic Nylon protects against abrasions, punctures and tears. 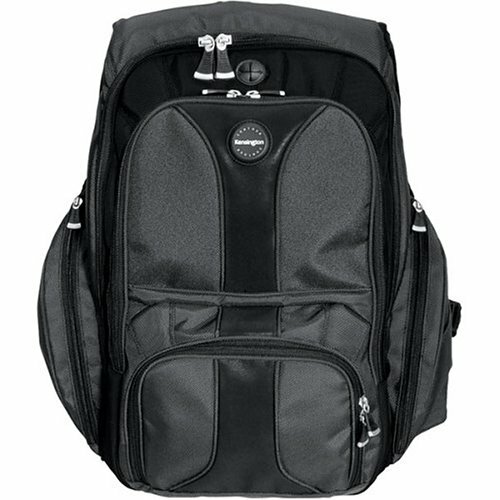 The Kensington 62238 Contour Backpack is the ultimate in mobility for the comfort-minded professional. The Kensington Contour Backpack has shock-absorbing, heavily-padded contoured shoulder straps that ease neck and shoulder strain, and an adjustable lumbar support panel that reduces fatigue by shifting weight onto your hips. The Kensington 62238 is constructed with 1680 Denier Ballistic nylon that provides protection against abrasions, punctures, and tears, with a SnugFit sleeve that suspends and wraps your notebook for drop protection. This notebook bag features a handle that doubles as strap to hang your case from wheeled bag, an expandable bottle holder, and a headphone port for your MP3 player. Endorsed by the American Chiropractic Association, it also features one-zip, flap-free access to the laptop compartment for quick removal at security check points, and a convenient front pocket that organizes key items at your fingertips. The Kensington 62238 fits most notebooks that are 17-inches or smaller, and is backed by a manufacturer's limited lifetime warranty. This backpack weighs 3.9 pounds, and has exterior dimensions that are 15.75 x 9 x 19.5 inches (WxDxH), and interior dimensions in the computer compartment of 11.5 x 1.9 x 15.8 inches (WxDxH). Kensington Edge: Carrying Case has contour adjustable lumbar support panel reduces fatigue by shifting weight onto the hips. Flap-free access to quickly reach computer and contents. Convenient front pocket organizes key items at your fingertips. these guys really know what they're doing!...this is a great bag!...i carry my 117 " hp laptop(not lite @ all) with all its cables + some more of my own, a huge external harddrive, its cables, a couple books and not only does it fit everything, but once i put it on u couldnt tell that i have so much stuff in there. the weight is so well distributed that i could carry all that stuff for hours and still be fine!...its just an awesome purchase , i hightly recomend it! I was glad to find a notebook backpack that doesn't make it look like I am going camping. It fits my Dell Inspiron 9300 (17" Widescreen) snugly and has space for my college books. Unfortunately after a week the stitching along the inside that connected the laptop compartment began to come out.